Establishing the facts, Investigating cases. When investigating a disciplinary matter take care to deal with the employee in a fair and reasonable manner. The nature and extent of the investigations will depend on the seriousness of the matter and the more serious it is then the more thorough the investigation should be. It is important to keep an open mind and look for evidence which supports the employee’s case as well as evidence against. It is not always necessary to hold an investigatory meeting (often called a fact finding meeting). If a meeting is held, give the employee advance warning and time to prepare. Any investigatory meeting should be conducted by a management representative and should be confined to establishing the facts of the case. It is important that disciplinary action is not considered at an investigatory meeting. If it becomes apparent that formal disciplinary action may be needed then this should be dealt with at a formal meeting at which the employee will have the statutory right to be accompanied. 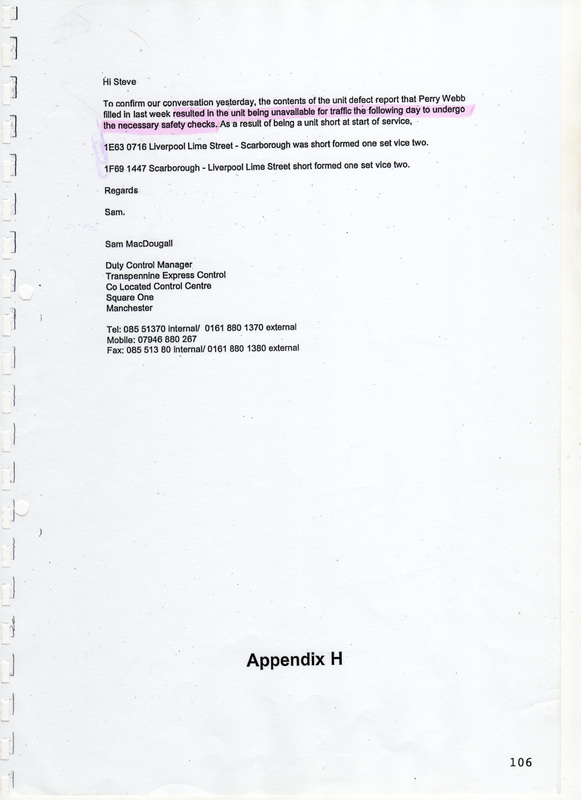 What you will actually see is, is a one sided, made to fit Investigation Report which never established the facts of the case that really mattered, Stephen Percival added his own touches that brought in information that I will show is irrelevant to the facts of this case. This Investigation Report is nothing more than a character assassination aimed at making me look as bad as humanely possible, you will notice that not once during this report is there any evidence used which would have supported my side of this argument. But lets all be brutally honest, we can expect nothing less from this bully-boy style of management. Please pay particular attention to what he says about the warning horn, as this was the reason why I was dismissed according to Judge Burton. 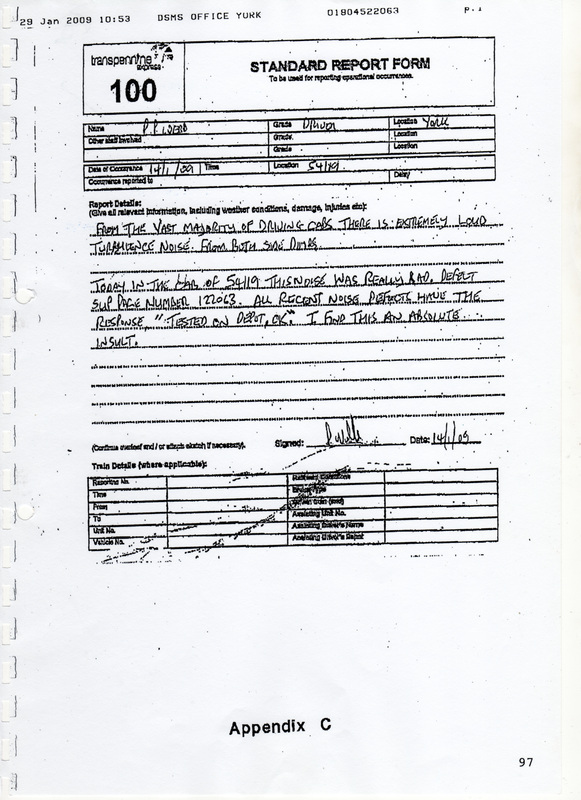 1.1 Maintenance staff discovered the defect slip incorrectly filled in as name, grade, depot, date etc were missing. This was not done deliberately as I always fill these out correctly. It was all down to the set swap at York and being distracted by trying to stop passengers getting on the wrong service, information screens said my train was an airport service but I knew it was going to Middlesbrough. In a rush I took the top blue copy without realising it had not been fully completed and stuffed it into my drivers bag. I fail to see how this can be classed as " Gross Misconduct ". 1.2 Why did the severity of the allegation keep the unit out of service ? Providing the defects had been remedied there was no need to keep it out of service. 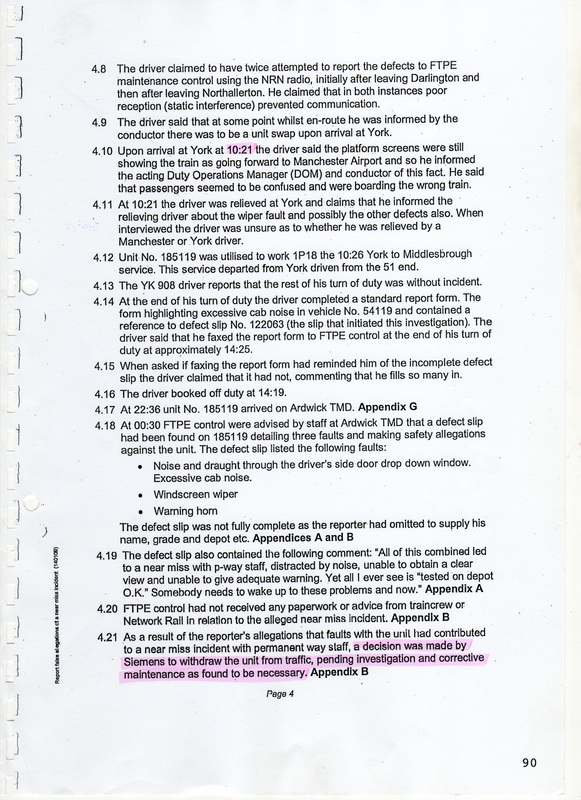 They have only themselves to blame for not making the decision to return the unit to traffic, a decision they made before 00.30hrs that morning (see Appendix B). If all repairs had been carried out there was nothing any further investigation could conclude to keep that train out of service. Information in this report at Appendix H proves the train was only kept out of service for the “necessary safety checks”, to be undertaken. a. Determine the facts: Do you call 5.8 used in conjunction with appendix J a fact of this investigation? This yet again, (how many times will this be used) highlights the management attitude towards me and their relentless effort to get me at all cost. This paragraph is nothing more than a character assassination. Aimed at maximising their case and damaging on my ability to be a driver. I was also unaware that my "words" with Driver Manager Pete Turpin had been recordable, it was an informal discussion but your making it look to be a written warning which it clearly was not, a further slur on my character. b. Formulate actions to address identified non – compliance issues: Only 2 issues were raised. c. Make recommendations aimed at preventing or reducing the likelihood of recurrence. See the only paltry recommendation at the end of this report! What you wrote here should be labelled basic facts, your missing key facts such as details on the cab environment which was very noisy, distractions at York on arrival, another really important factor is the weather, a copy of the weather report is below. This report will be used next to highlight a key point not included in this investigation. The following charts show the temperature in Newcastle and Manchester on and before my departure time of 09.12 hrs. What this highlights is regardless of Steve Bridge`s thoughts that the weather was not of a temperature to cause problems with the horn, he was clearly wrong. His judgment was made while being in Manchester. 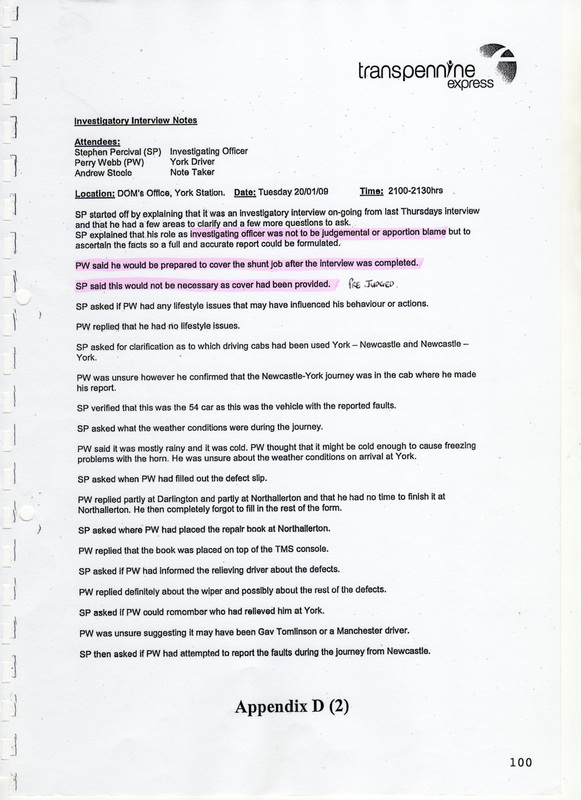 So why did Stephen Percival take this as being acceptable to his investigation? Also temperature in York would not have been of a temperature to cause the horn not to work on departure from York. The decision was for me to judge and make. Otherwise where does it state that a driver must ask permission from control to move his train because the temperature might not be acceptable to them? 4.6 I stated the weather conditions were mostly cold and rainy, with temperatures low enough to cause the warning horn to freeze up. 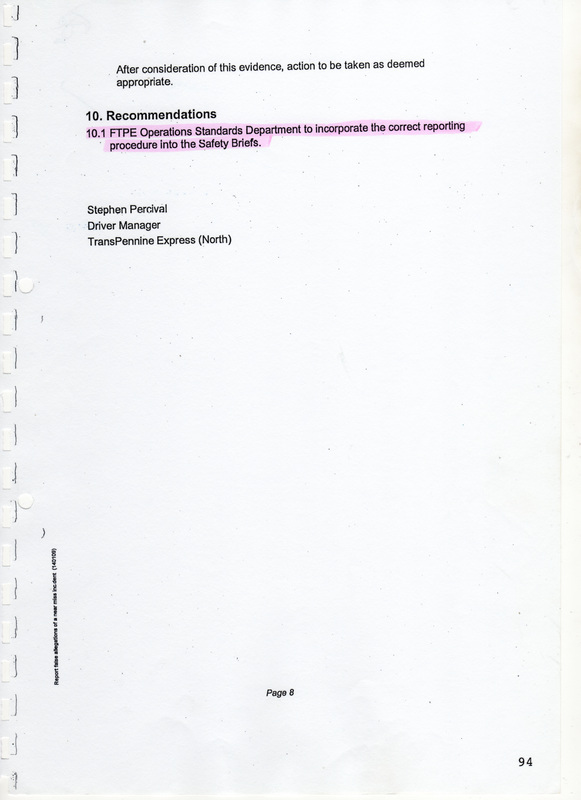 Unbelievably a FTPE technical engineering manager called Steve Bridge disagreed, ( see Appendix F ). His report states, "Note I do not believe the temperature on the 14th was at a level which would cause a problem with the horn in service". I would like to know how Steve Bridge came to this conclusion, when he was in Manchester on the 14th. I obtained a copy of the weather reports for Newcastle on the 14th January, At 08.30hrs the temperature was -1 and at 09.00hrs it was -2, the statement by Steve Bridge clearly highlights the carefree attitude and the ignorance of TPE to think that because a Technical Manager does "not believe", the temperature was cold enough, that`s enough for them and I am once again in the wrong. 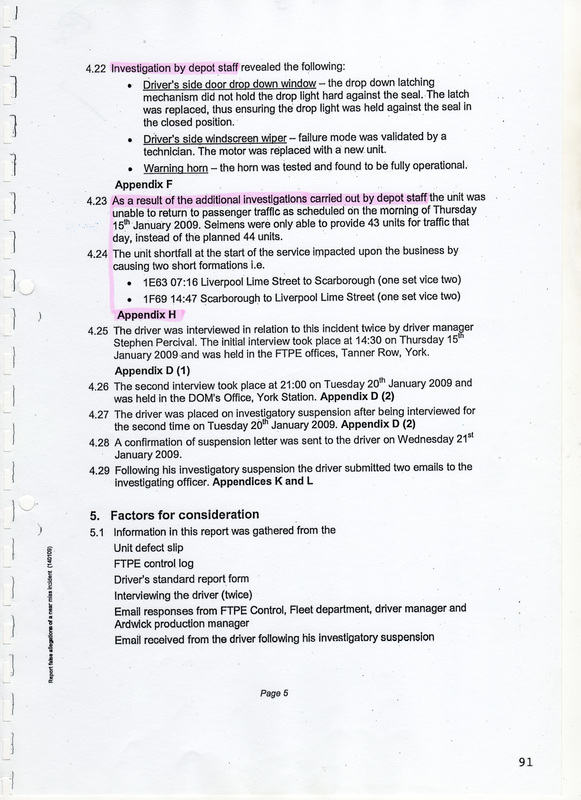 It highlights also Steven Percival`s unprofessional, biased and blinkered approach to this investigation. 4.8 I did make 2 attempts to contact control via the NRN radio. The NRN radio does not show up on the data recorder when you use it, despite TPE clearly labelling the download data sheet as, "No evidence of the NRN being used". 4.10 The train arrived in York nearer 10.30, then there was all the confusion of Airport passengers boarding this service which was now going to Middlesbrough, but yet again this is irrelevant to Stephen Percival because it backs me up on the issue of time especially as I needed the toilet and a drink before relieving my next service at 10.49. 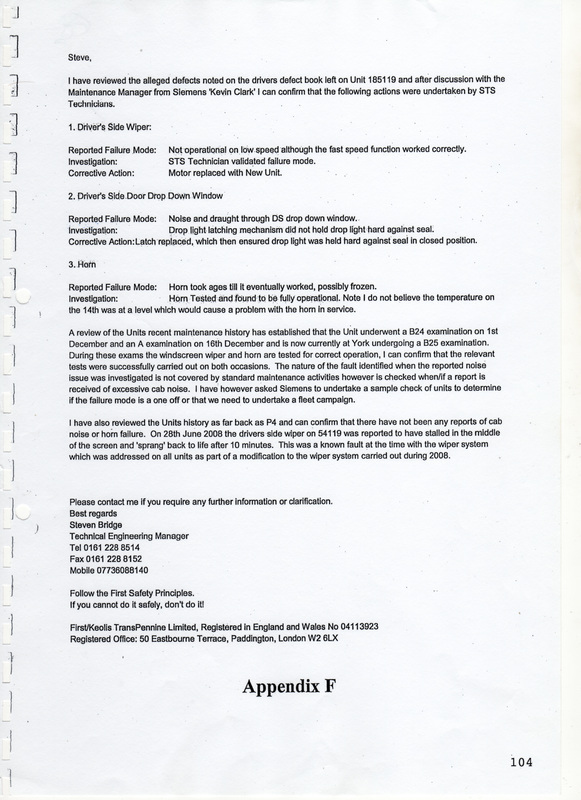 4.22 Investigation by depot staff apparently only revealed the 3 issue`s I had raised. Yet 2 other defects should have been apparent, Saloon HVAC`s blowing cold air and the Night Headlight had failed. 4.23 What additional investigations were required and carried out? The so called investigation into whether a near miss had occurred was sorted out with Network Rail before 00.30hrs on the 15th January as will be proven later in this report. That only left the 5 faults, and as we shall see 3 of these faults are described as "necessary safety checks", so quite obviously Siemens did not have time to carry out the "necessary safety checks". _5.8 This paragraph is totally irrelevant to this investigation and is clearly used to make me look as bad as possible. If after my 2004 incident (which will be highlighted later) I am quite sure that I would have been jumped on if I really did have a long standing and recorded history of submitting reports containing sarcastic and derogatory comments. To make me look even worse a letter, Appendix J which was as stated an informal discussion, in other words a quiet word is turned into what can only be described as a written warning. If this has relevance to my investigation and obviously played a part in the decision making to charge me with gross misconduct why were my previous reports that I mentioned in the investigation interviews not used? This was never a level playing field. This informal chat has no relevance to this investigation. 5.9 I always held my hands up and said from day one that the near miss never occurred. What did Steven Percival want me to do? My actions were caused because I understand the serious consequences of running trains with defective warning horns. The severity is his thoughts caused by the way he investigated this incident, again aimed at inflicting damage on my character. My attitude was exemplary, my actions were of a very concerned individual on the possible consequences of constant ignorance and a management oblivious to the possible outcome. Please read Appendix K in conjunction with this. _ 5.2 I disagree with the first sentence of this passage as I did request accompaniment at the second interview. I couldn’t dispute this at the time because I was never asked to sign any copies of the interview minutes. 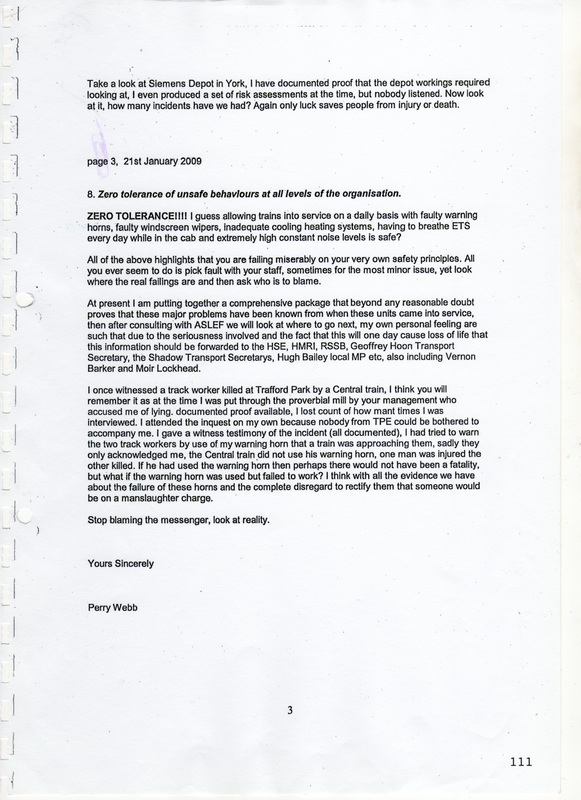 I did however dispute this in my letter to TPE dated 21st January 2009 (Appendix K). 5.8 This paragraph is totally irrelevant to this investigation and is clearly used to make me look as bad as possible. If after my 2004 incident (which will be highlighted later) I am quite sure that I would have been jumped on if I really did have a long standing and recorded history of submitting reports containing sarcastic and derogatory comments. To make me look even worse a letter, Appendix J which was as stated was an informal discussion, in other words a quiet word is turned into what can only be described as a written warning. If this has relevance to my investigation and obviously played a part in the decision making to charge me with gross misconduct why were my previous reports that I mentioned in the investigation interviews not used? This was never a level playing field. 5.12 Why would Steven Percival bring up 2 previous unrelated incidents that I was involved in which are totally irrelevant to this case. (Allegations of traction unit left unattended will be looked at later), They are not factual to this investigation. As pointed out before, YET AGAIN, it`s a constant bombardment of my character to inflict as much damage as possible. What both these incidents did highlight was TPE`s heavy handed attitude towards me. There was however at that time still some serious safety concerns at the Siemens fuel point. 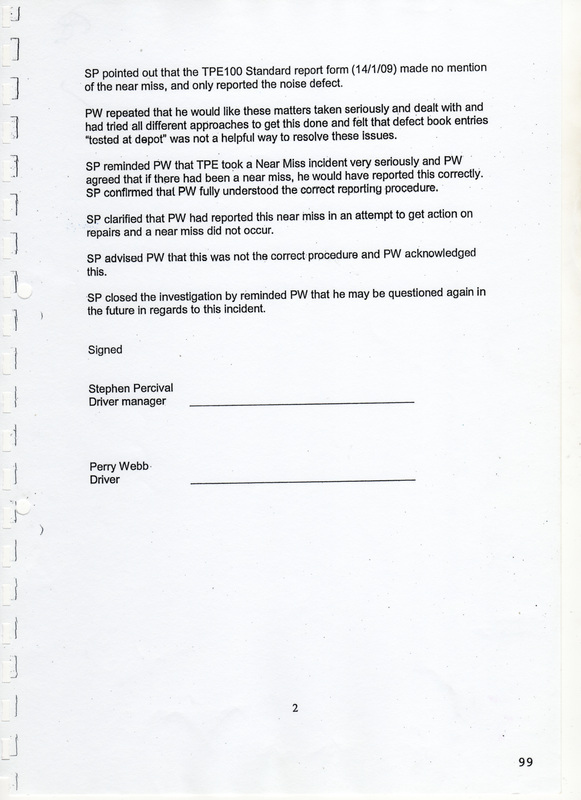 6.1 The only “cause”, that Steven Percival can come up with is, “failure to follow the correct reporting procedure when submitting a unit defect slip”. This is the only cause, conclusion he has? Yet this warrants a gross misconduct charge? 6.2 I have every reason to be worried about the defects and the attitude in rectification. My file on these defects and the appalling efforts of Siemens combined with the ignorance of TPE Management are testament to this. Also I did witness the death of track worker Lindsay Warrington through not hearing a warning horn. So I am fully aware of what could happen. DEATH. 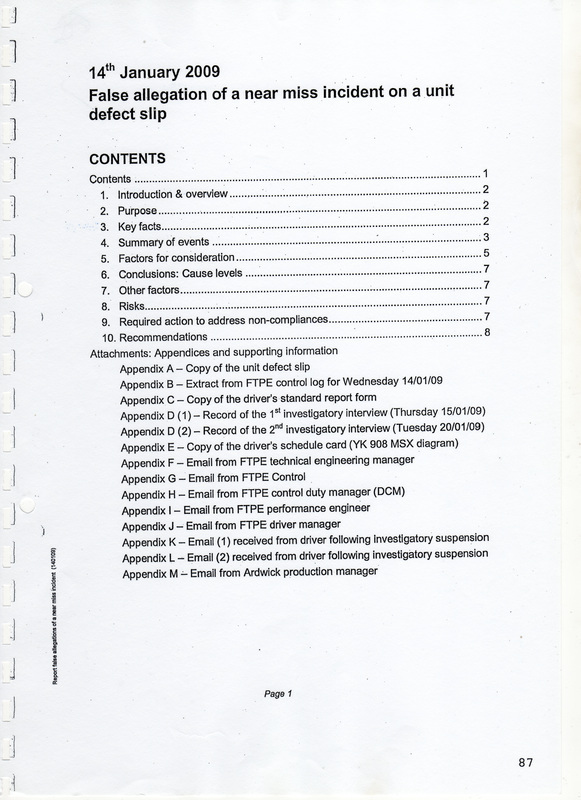 Why wasn`t my files on these defects investigated? Although I do believe TPE`s admission in the fleet update is more than enough proof to show they were aware of this and choose to do nothing about it. 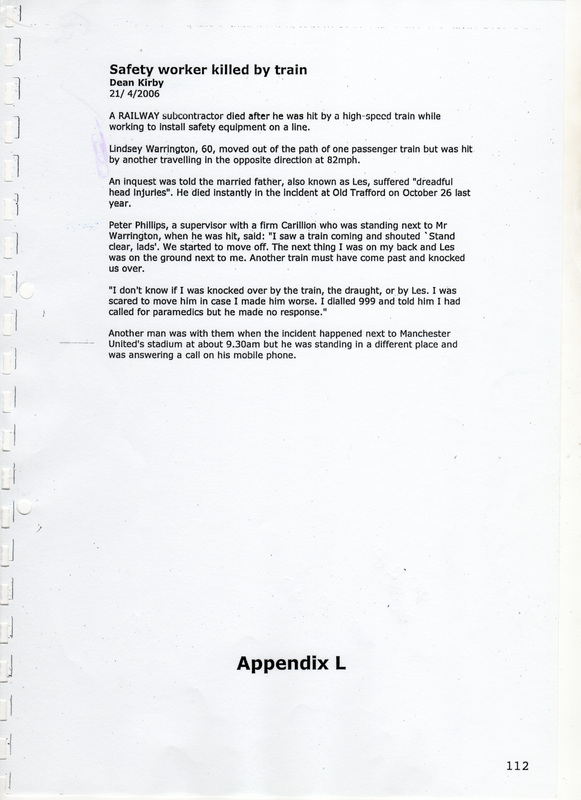 8.1 Steven Percival stated, "the main consequence of this incident was that two services were short formed with the resultant inconvenience to passengers". Main consequence? HOW IS THIS A RISK? Where is the risk involved? How is an “inconvenience” deemed a risk? It clearly demonstrates to me that this incident and charges of gross misconduct are down to one thing and one thing only, MONEY Its not the first time that delay, short formations and impact on business etc have been mentioned. 8.2 This is an amazing statement to be classified as a risk, “ Had the unit been out of traffic for a longer period there may have been cancellations to services “. Please explain, how can this be classified a risk? The statement is hypothetical, Its further evidence that the only issue bothering TPE is the cost factor. Health and Safety goodbye. 8.3 There is enough evidence to prove that although that unit stayed in service for the remainder of the day, when I handed it over, I did not perceive those faults to be of a nature that put anyone at risk. Furthermore the remainder of drivers who drove this unit also allowed this unit to remain in service, did any of them find a problem? The answer is NO. It`s very evident from this section on risks that YET AGAIN this was written to make me look bad, but it also highlights that quite obviously the person writing this investigation is so hell bent on putting myself as far down as possible that they do not understand what topic they are actually writing about. Personally the main risk for me, is the one taken in allowing trains into service with defects that can occur at anytime, especially defects that are a “known” defect. 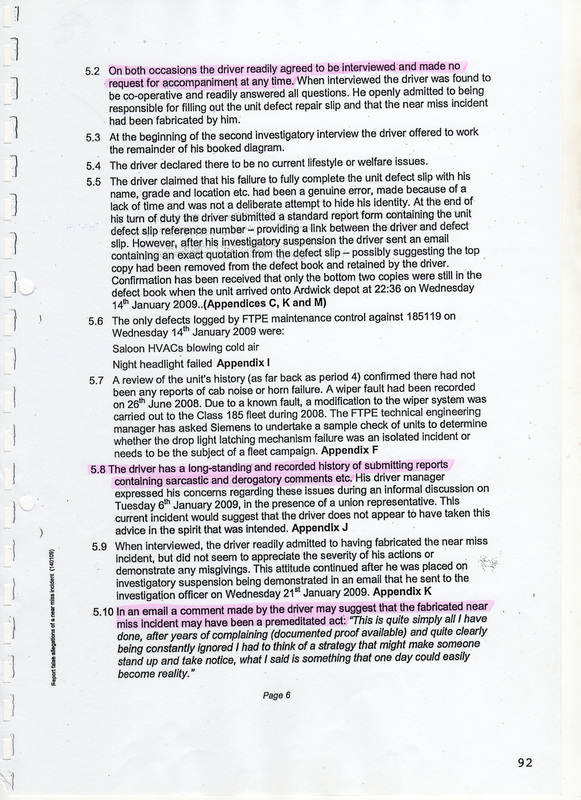 8.3 Which correct reporting procedure is Stephen Percival talking about? If the unit on arrival in York still had a partial failure of the warning horn and I had informed Control, the following is what I would have done. I ring Control and state partial failure of warning horn, control follow their contingency plans, train can remain in service, but hold on, we have turned the unit round, its being driven from the other cab, back to Middlesbrough, the train remains in service. Asking all TPE Drivers reading this, what would TPE have done if informed this unit had a partial warning horn failure? 8.3 & 9.1 Why is it faults that I believe to be serious? When has it ever mattered what I believe? Obviously its not faults that they believe to be serious because they allow trains to run all the time in weather conditions that affect the functioning of the warning horn. Out of an incident deemed so serious to suspend me and charge me with gross misconduct the Investigating Officer, Manager Percival comes up with only one recommendation.10, “FTPE Operations Department to incorporate the correct reporting procedure into the safety briefs”. 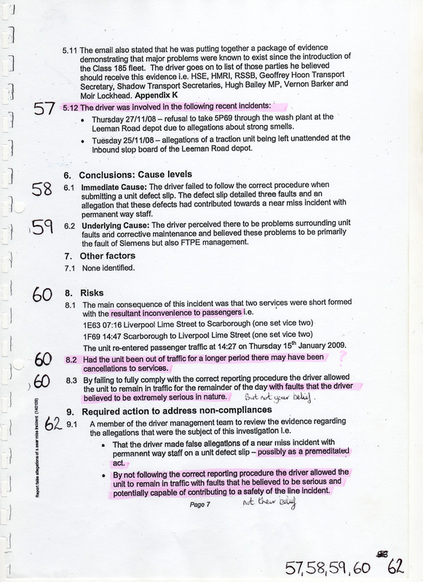 This shows that they were aware that drivers do not report matters how they should.You would however have thought that out of such an incident that warranted charges of gross misconduct as TPE see it, this recommendation would have been implemented, but as the emails I received from drivers show (drivers responses highlighted in red), not one of them who responded has had a safety brief where this has been mentioned or in some cases had a safety brief. This just shows how seriously TPE have taken this incident. Drivers Emails to follow. Please note, your names and email addresses have been removed for your safety (job security), and I thank you for your assistance in this matter. Good to hear from you, hope you're doing o.k. I don't remember the exact date I last had a safety brief, but it was late last year, probably September, October, possibly even November. As far as I recall, the recommendation you refer to was not briefed, although I could be mistaken. Sorry to not be more helpful, if anything comes to mind, I'll let you know. (This email is more than 1 year after Stephen Percival`s recommendation). To be honest the answer is NO i aint had a brief since last year !!!!!!!!!!!!!!!!!!! 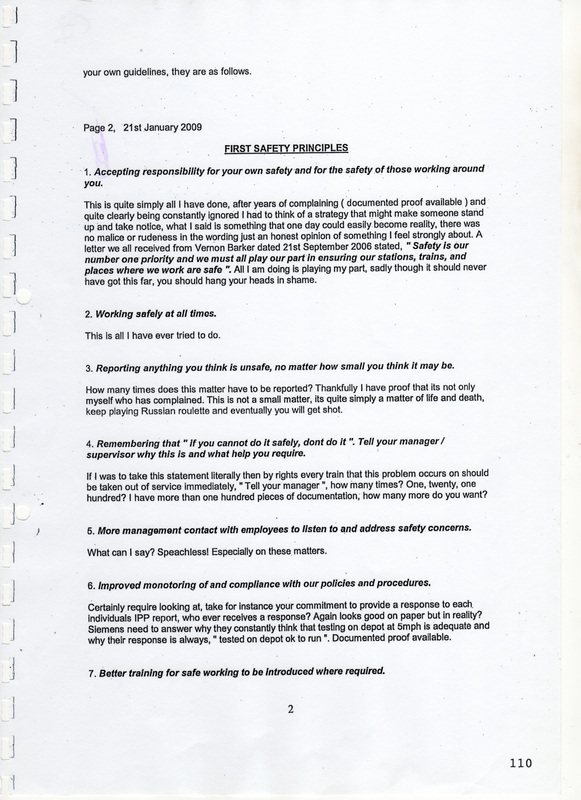 Regarding Safety Briefs I had one a XXXXXXXXXXX and don't recall FTPE Operations Standards Department to incorporate the correct reporting procedure into the Safety Briefs been mentioned. The best people to ask would be the guy's who present the briefs such as Steve Whitehead, Trevor Elliot or Gordon Anderson. No idea when my last safety breif was, but i know it didn't mention warning horns...then again i have XXXXXXXXXXXXXXXXXXXXXXXXXXXXXXXXXXXX I did have a safety encounter but horns were never mentioned in that either. I'll have to get back to you with the exact date (my old diary is in my locker at work) but it was last year sometime when I last had a safety brief. However I don't remember seeing/hearing anything about warning horns! Further to yesterday's email, the only safety brief I've had in the last 18 months was on XXXXXXX last year. There was nothing about horns mentioned! Can't give you an exact date as I XXXXXXXXXX at the moment,it would have been either November or December 2009,to the best of my knowledge,the recommendation below wasn't discussed. My last safety brief was before christmas and i think before we even had any snow and cold weather so i dont think we did have the recommendation i ask around , people on brief today . My last safety brief was around XXXXX or XXXXXX last year. I have no recollection of any discussion regarding the reporting procedure for defective warning horns. XXXXXXXXXXXXXXXXX, The instructors who facilitate the briefs are S WHITEHEAD, T ELLIOT, A LOCKWOOD and G ANDERSON. They may be able to provide you with some info. 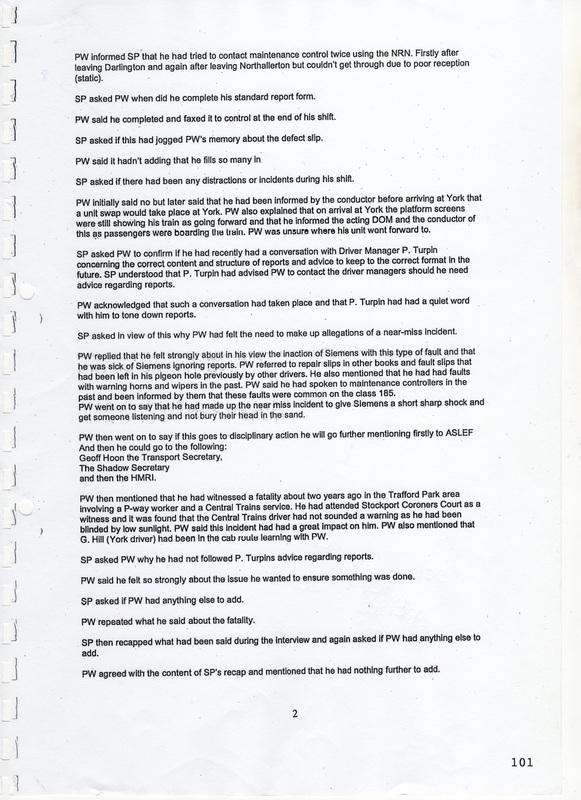 Continuing with Stephen Percival`s Investigation Report. On the 14th January 2009, I wrote the following entry on a class 185 repair book sheet. Noise and draught through drivers side door drop down window. Noise levels excessive. Windscreen wiper only works on fast speed intermittently stopping all together. Warning horn took ages till it eventually worked, possibly frozen. All of this combined led to a near miss with p way staff, distracted by noise, unable to obtain a clear view and unable to give adequate warning. Yet all I ever see is, “tested on depot, ok”. Somebody needs to wake up to these problems and now. _ The unit went on to the depot at 22.36hrs, by 00.30hrs, they had ascertained that no near miss had been reported to any signaler and that TPE had received no associated paperwork. Therefore all that is left for them is to check out are the alleged defects and repair if necessary, once the defects are rectified there is no reason or further investigation required. Never has it been known that a train is taken out of service if a near miss is reported. Also at the bottom of this page, the date of the control log is the 14th January, yet at 00.30hrs it was the 15th January. Also next to incident number it states, “No delay”, this was supposedly filled in at 00.30hrs on being advised by Siemens at Ardwick Depot. But as the log points out, “yet no near miss has been reported to any signaler and no paperwork or advice has been received to TPE control”. It would take time to find out if this so called near miss had been reported, so after only just being advised how can it be that they already have the answer! Why did they make the decision to remove the train from service before 00.30hrs how could they be sure their so called investigation would not be completed in time? This was a cut and paste, made to order, made up Control Log with all the above mistakes. You will notice above that "the unit is now stopped at Ardwick for further investigation before going to York for a B Exam". So its highly unlikely that this unit would have gone into service anyway as it is overdue the B Exam. Report reads "From the vast majority of driving cabs there is extremely loud turbulence noise from both side doors. Today in the cab of 54119 this noise was really bad, defect slip page number 122063. All recent noise defects have the respons, "Tested on depot, ok", I find this an absolute insult. 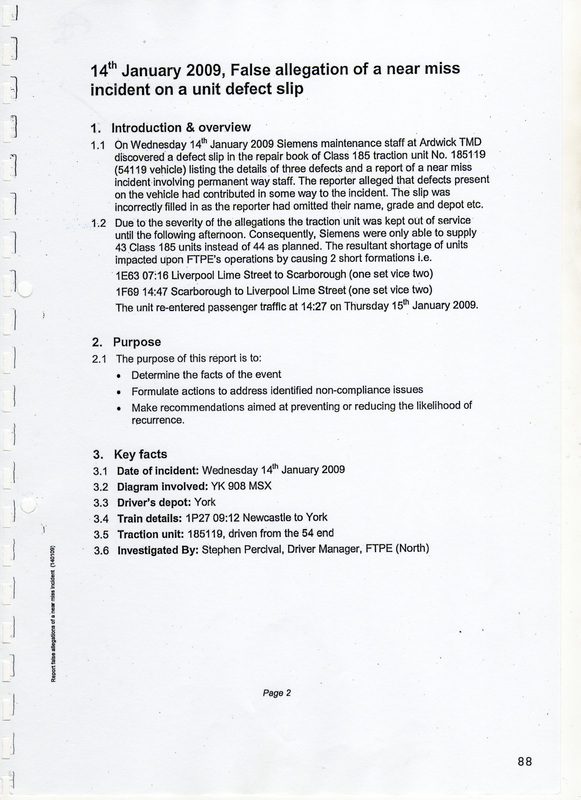 The noise issue was certified by Mark Atkinson in his Witness Statement, " 22.2 the excessive noise in the cab was always present on the Company's 185 trains; and". I did not mention the warning horn or the wipers because I intended to put together a more detailed comprehensive report on these 2 faults (which will be displayed on this site at a later date). "Unit No 185119 has been withdrawn from traffic due TO ALLEGATIONS ABOUT DEFECTS"
The Following are also the reasons why this unit remained out of service, all quotes from TPE and Siemens. "Due to the severity of the allegations within the defect slip". "As a result of the additional investigations carried out by depot staff". "To undergo the necessary safety checks". "Pending investigation and corrective maintenance as found to be necessary". The "reaction" that I wanted was somebody, anyone to explain to me fully why all my reports on these faults were constantly ignored and why after not days or weeks or even months, but years there was nothing being done to rectify these faults. All it would have took, was someone to speak with me and explain, if I was able to understand exactly what their problem was, then maybe I would have stopped the constant stream of reports. But sadly, in order to do that, you need dialogue, which for me was mission impossible with these people, their ignorance was a deliberate ploy to get a reaction. 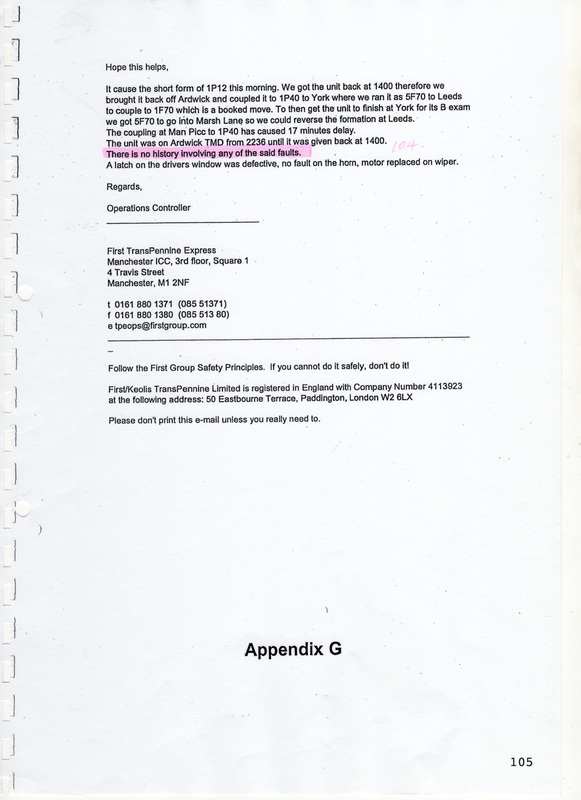 Appendix D (1) being the original notes from the first Investigatory Interview. You will notice that on the first page (above) I make it quite clear, that there was NOT a near miss and I pointed this out continually when being further questioned. How can I possibly be charged by Barry Cook with the following? 2. You also failed to follow the correct procedure for reporting a near miss incident, resulting in a train being taken out of service. You subsequently admitted that this was a false allegation. Did I clearly explain that there had not been a near miss? I could not possibly report something that never happened, so how can I be charged with not following the correct procedure (which is not to be found anywhere as an actual written down procedure). 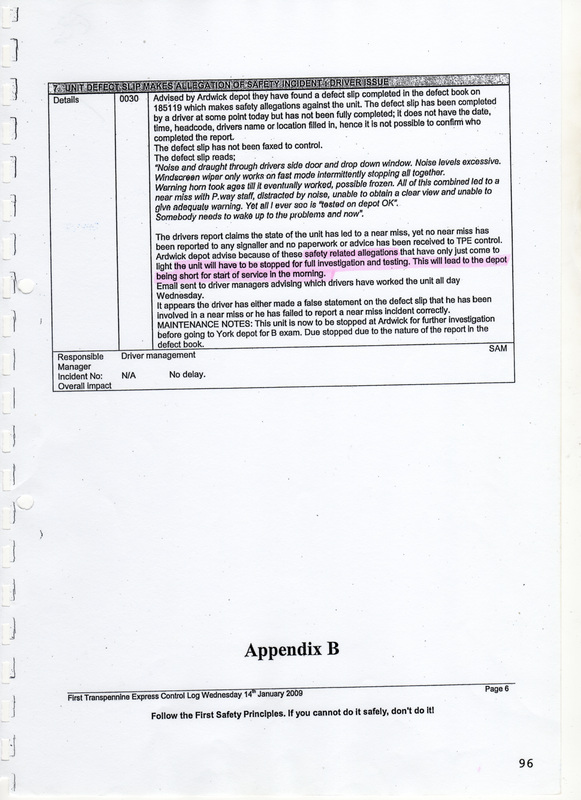 When TPE were asked for this procedure, Charlotte Pears replied it was as per the rule book, when pointed out it was not there, she responded with, it is in the Driver Competence Standards Booklet, if it is in there, I cannot find it. SP started by saying that as investigating officer he was "not to be judgmental or apportion blame but to ascertain the facts so a full and accurate report could be formulated". SP says this is not necessary as my job has been covered. This straight away suggests that the outcome of this investigatory interview is all ready predetermined, SP has no idea what I will say but has already decided my outcome. He is already being judgmental before we start. PW Said it was mostly rainy and it was cold. PW thought that it might be cold enough to cause freezing problems with the horn. He was unsure about the weather conditions on arrival at York. I actually told them that it was below freezing in the North East area and that the nearer to York we traveled, the milder the weather became. I do have weather charts to prove what I said was true. PW Was unsure suggesting it may have been Gav Tomlinson or a Manchester Driver. Confusion was such, that I did briefly speak with the relieving Driver who I think was Gavin Tomlinson, but cannot honestly remember, but as Manchester Drivers do not sign Middlesbrough, I assume it was Gavin. Why didn`t Stephen Percival ask the relieving Driver for a report on what happened when he relieved me at York? 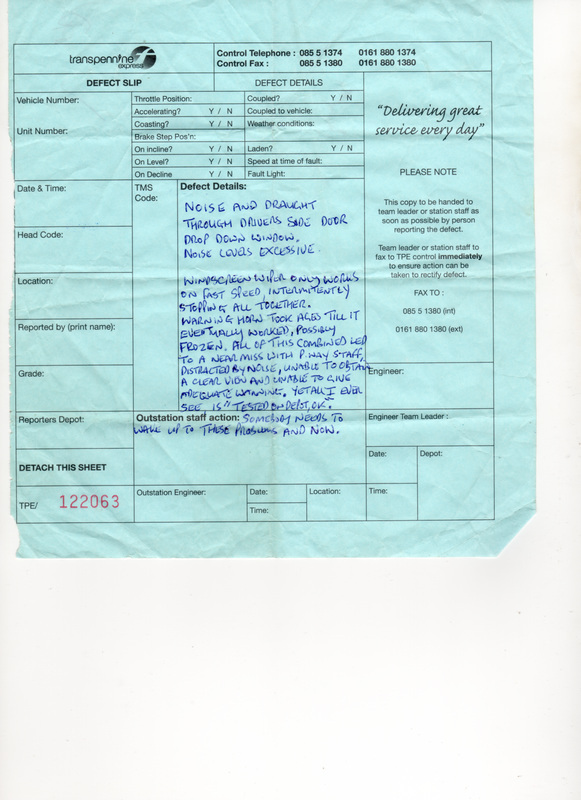 Why wasn`t any Driver who drove the unit that day after me asked for a report? The answer is simple, because any other Driver would have said that there was nothing wrong with the unit, but TPE want people to think that the unit stayed in service with major faults and it should have been removed from service. Notice the conversation I had with Manager Peter Turpin is mentioned, nothing to do with this Investigation. 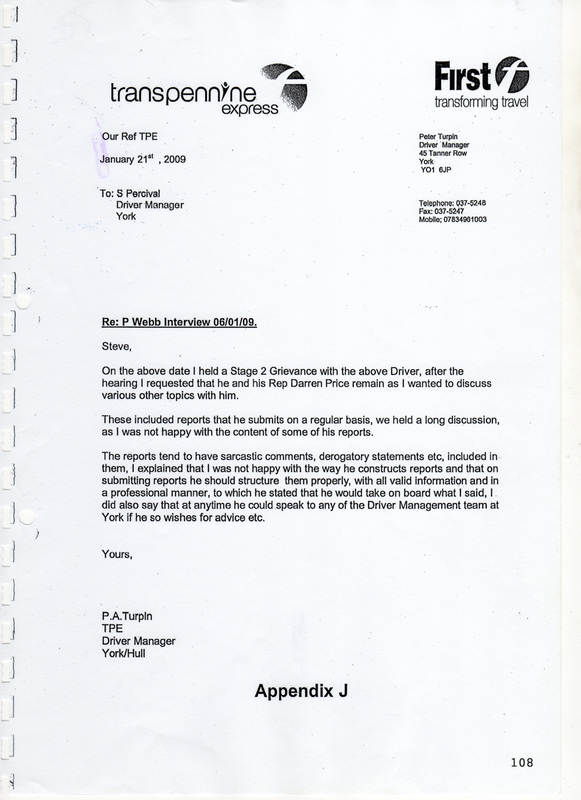 Stephen Percival states at the begining of this interview that "his role as investigating officer was not to be judgmental or apportion blame"
Stephen Percival now says, "that after consideration of the evidence that he had available and in view of the serious nature of the allegations that he felt it necessary to place PW on investigatory suspension with immediate effect". "It was his decision and that he felt it justified owing to the seriousness of the allegation and the impact it had on business". So he was not to be, JUDGMENTAL or APPORTION BLAME! Please note above, "Note I do not believe the temperature on the 14th was at a level which would cause a problem with the horn in service"
Please notice how the above information has been cut and pasted possibly from an email, therefore not timed or dated. This is without doubt 100% proof that the unit being kept out of service causing the short formations the following day was due to Siemens rectifying the 3 faults. This is something that they would have to do regardless of any other issues and it is summed up perfectly by Sam MacDougall when he states, "the unit being unavailable for traffic the following day to undergo the NECESSARY safety checks". Necessary safety checks you would think are mandatory, therefore if this unit arrived at the depot and there was only the 3 issues in the repair book,this unit would still have been delayed coming off the depot. Or would it? You see, I have categoric proof which will be shown later, that TPE and Siemens allowed units off the depot without carrying out the necessary safety checks on numerous occasions! Another undated and untimed cut and paste email? 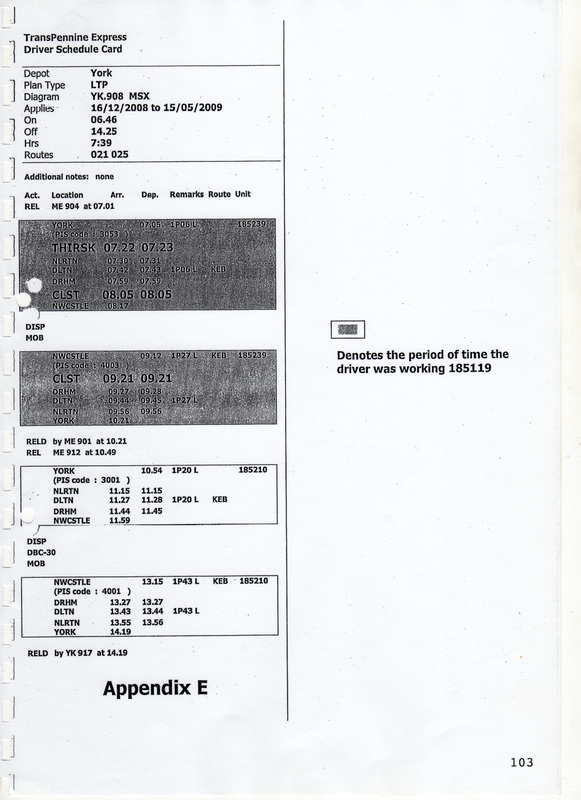 This shows that 2 other defects were logged by a driver or drivers on that day in question, it also shows that if any other driver had a problem, especially with the warning horn, it would have been logged. It also highlights the same as Appendix H, that "to address the issues raised", which were the 3 issues, namely warning horn, wipers and noise.This unit was obviously a lucky one, it seems that the 3 issues I raised were actually looked at, unlike numerous other occasions when on many other units they were ignored and YES I do have proof, as you will see later. This letter is totally irrelevant to this investigation and is clearly used to make me look as bad as possible. I am quite sure that I would have been jumped on if I really did have a long standing and recorded history of submitting reports containing sarcastic and derogatory comments. I CHALLENGE PETER TURPIN to disclose these so called reports. We had an informal discussion, in other words a quiet word which Peter Turpin has turned into what can only be described as a written warning. 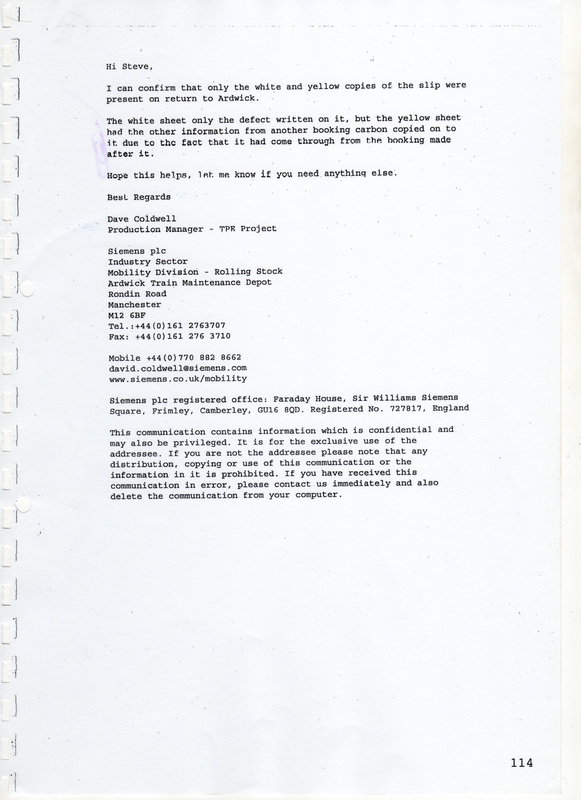 But the very nature of this letter appearing in this Investigation Report shows that it was made to order. If this has relevance to my investigation and obviously played a part in the decision making to charge me with gross misconduct why were my previous reports that I mentioned in the investigation interviews not used? The biggest travesty of justice here is the Stage 2 Grievance, Stage 1 was put in nearly 5 years previous!!!!! That is real IGNORANCE, I will highlight this later. That concludes the Investigation Report of Stephen Percival. 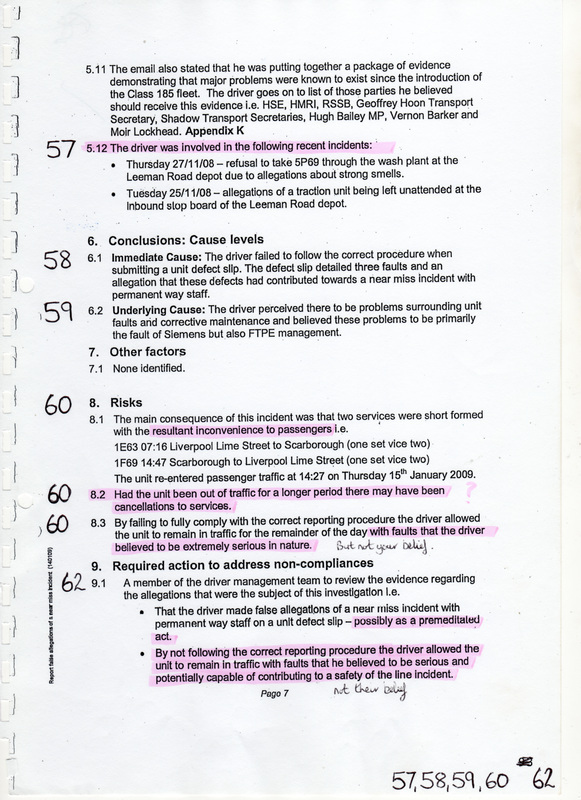 This Report was now given to Route Driver Manager Barry Cook. The following are the 3 charges that he decided I was guilty of from reading this report. Below this letter I will evaluate each charge and see if the charge actually came from information contained within the Investigation Report. 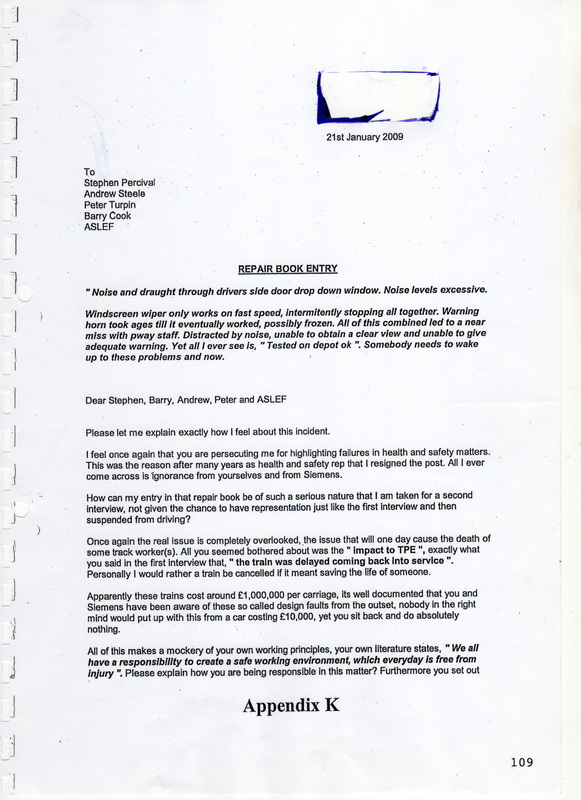 ​On the 10th February 2009 I received a letter from Route Driver Manager Barry Cook with the 3 charges of alleged gross misconduct. 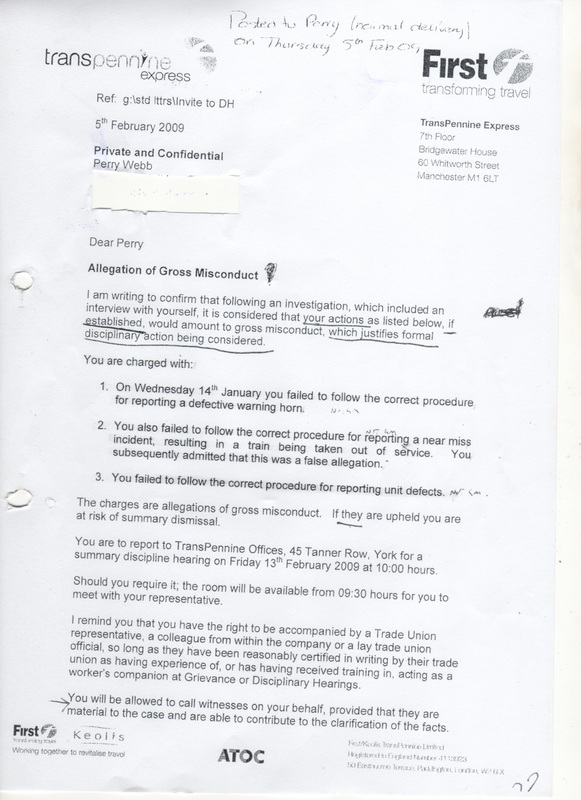 It says that my actions if established would amount to gross misconduct. It further states that if they are upheld I am at risk from summary dismissal. “They”, being the key word. Which would mean that all 3 have to be upheld. Charge 1, On Wednesday 14th January you failed to follow the correct procedure for reporting a defective warning horn. There was no appropriate rule book prefix with this charge, I knew what occurred that day but quite clearly Barry Cook was so unsure that he only called the warning horn, (defective), there was no mention of a complete or partial failure of this warning horn as defined in the rule book. How can I be charged with gross misconduct on the information he used from the investigation which failed to ascertain what was wrong with that warning horn? There is nowhere in that investigation that shows what type of failure the warning horn had on that morning in question, this surely should have been a major point to have ascertained. 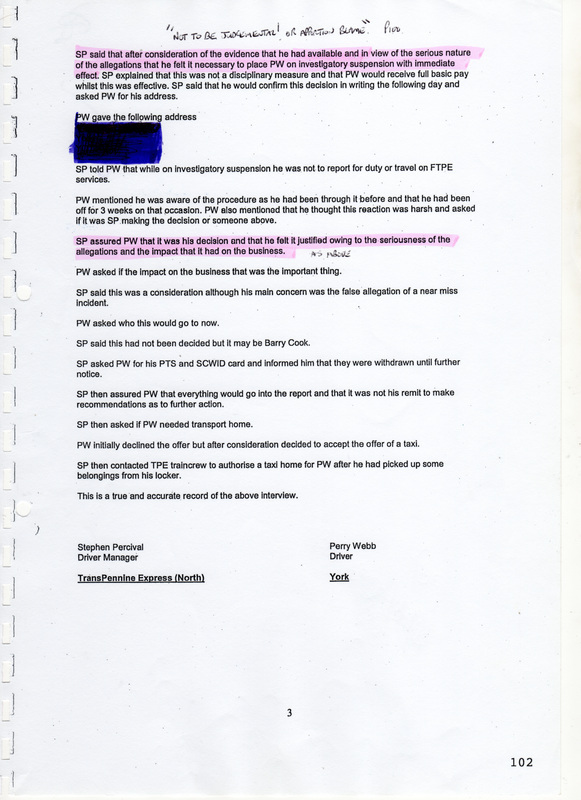 How could Barry Cook form a belief that I am guilty of gross misconduct on a non specific charge? Barry Cook, quite clearly did not understand from the investigation report what actually happened that morning, therefore his belief can only be based upon assumption not fact. Yet this warning horn was the most paramount issue and concern that sparked my repair book entry. For interest, I was also never asked once about the wipers or noise issues that were also part of my repair book entry. Charge 2, you also failed to follow the correct procedure for reporting a near miss incident, resulting in a train being taken out of service. You subsequently admitted that this was a false allegation. I split this into 3 separate issues. Issue 1, you also failed to follow the correct procedure for reporting a near miss incident. 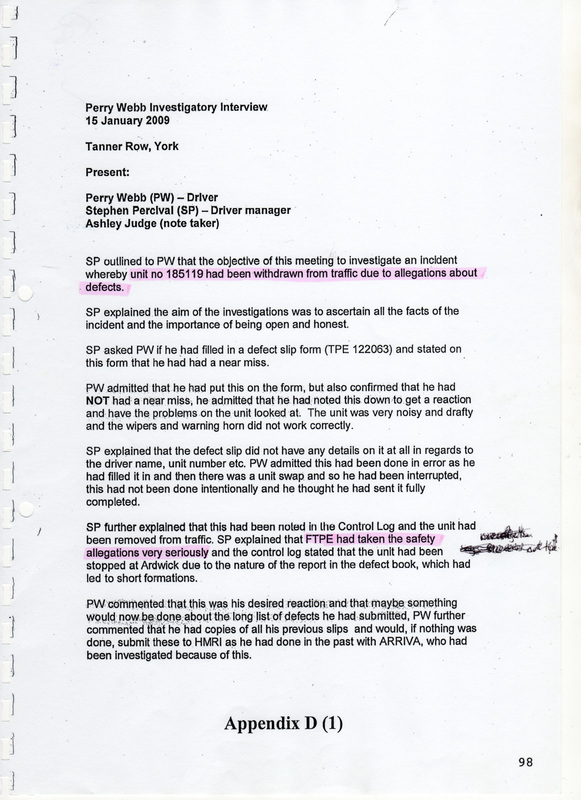 I explained from the very first interview on the 15th January 2009 that I had not been involved in a near miss, it says, “but also confirmed he had NOT had a near miss”. However there is no procedure to be found for reporting a near miss. So why was I charged with this? 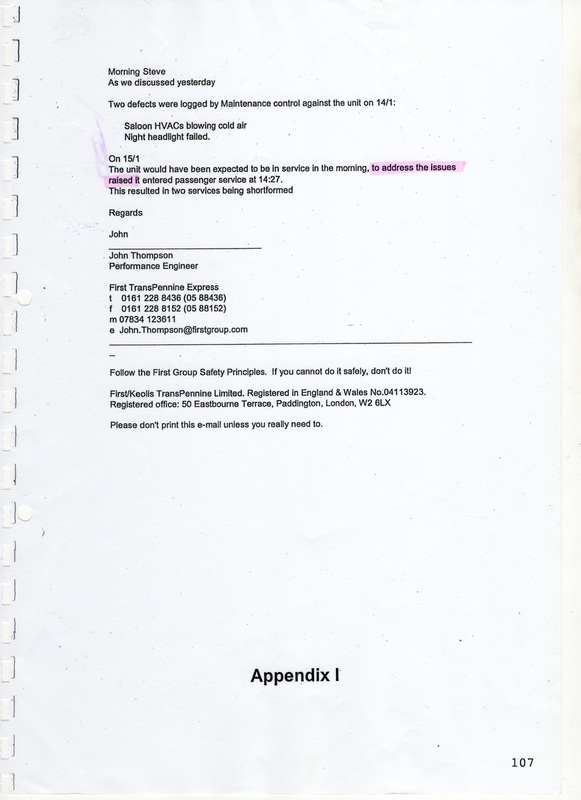 I requested from Employee Relations Manager Charlotte Pears a copy of the near miss reporting procedure, Miss Pears response via email, said, “In respect of the near miss reporting procedure this would be as per the rule book”. I requested a copy of the rule book near miss reporting procedure because I could not find the procedure. I was then informed by Miss Pears,“I understand the rule book does not specifically cover near miss incidents, however this is covered in Train Driver Competence Standards & Guidance, (SC1)”. There is also no mention of a so called near miss reporting procedure in this document. 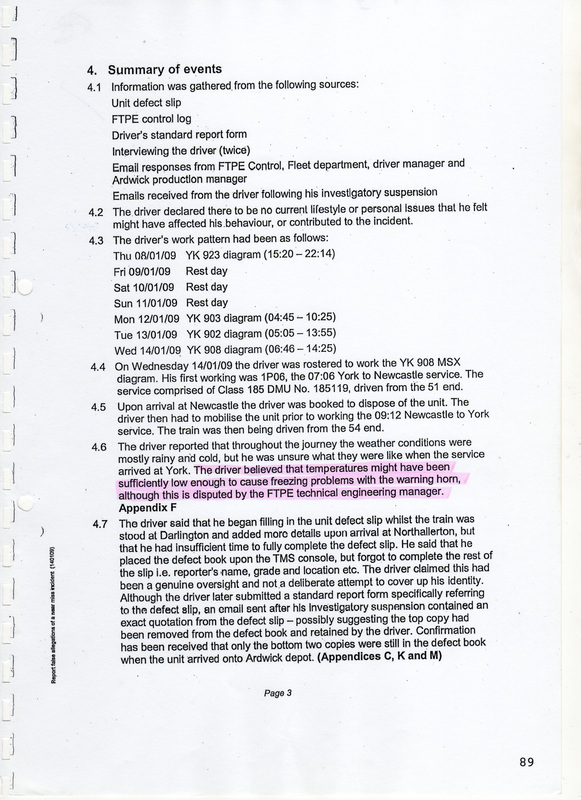 Is this evidence of Manager Barry Cook having a reasonable belief, supposedly in my guilt, that when the procedure he refers to and TPE are then asked for a copy, they cannot pinpoint where it can be found.Finally on this issue, how can I be charged with reporting something that never happened, Barry Cook might as well have said I failed to stop at Darlington, it beggars belief that I am found guilty of something that didn`t happen, how could I possibly report a near miss if it never happened? Issue 2, "resulting in a train being taken out of service". This is not worded as an actual charge and the train was not taken out of service, it finished its booked diagram work at the end of the day. Issue 3, "you subsequently admitted that this was a false allegation". Is this statement though, actually charging me with making a false allegation? Or am I being charged with the admittance of making a false allegation? This would be totally different. 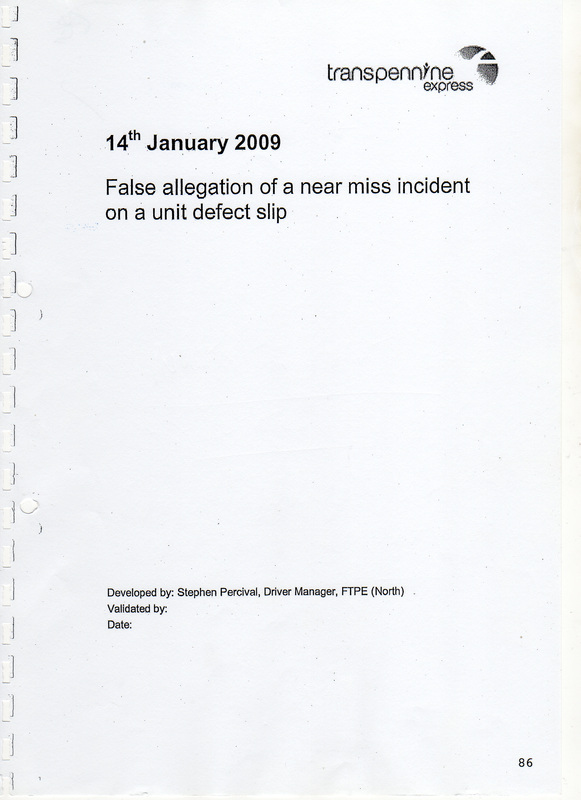 If the false allegation was the main issue and as the wording of the investigation says, “false allegation of a near miss incident on a unit defect slip”, why wasn`t this charge worded as a charge in its own right and not as a footnote. Charge 3. "You failed to follow the correct procedure for reporting unit defects". Like charge one, very non specific and without showing which part of the rule book I allegedly failed to follow. I can only assume it refers to the windscreen wiper and the noise coming from the driver`s door. How can this be classed as gross misconduct without a procedure to follow? Even if there was a procedure it would not amount to gross misconduct.